Janet Stewart was born in America’s heartland, Des Moines, Iowa. She was to see the Pacific Ocean for the first time from the Palisades in Santa Monica, CA at the age of twelve. She knew she would never live far from it again. Janet had her first one-woman show in 1978 in Pasadena, CA. She began accumulating ribbons and medals from juried shows. 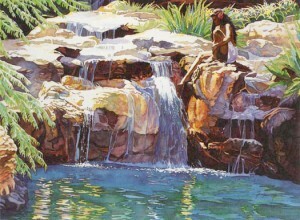 She says her works were most influenced by Corinne Hartley and by the Impressionists: “Degas for his draftsmanship and anatomy, Gauguin for color and atmosphere, and Sorolla for the handling of light.” It was Corinne who helped her with her ability to portray personality and emotion, the hallmarks of her paintings today. 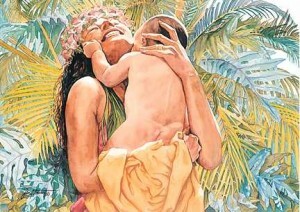 After many visits to Hawaii she finally settled close to the ocean shore in Lahaina, Maui and has fully embraced the spirit of Aloha. 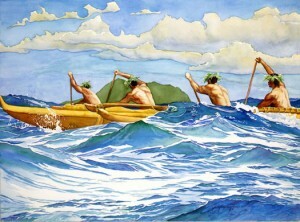 Janet captures the essence of the islands and it’s inhabitants in her paintings. This entry was posted on Saturday, July 4th, 2009 at 2:01 am. 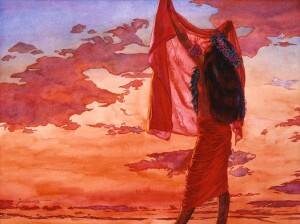 It is filed under Pacifica's Artists and tagged with Aloha, art prints, Degas, for art collectors, for art dealers, Gauguin, greeting cards, Hawaii, hawaiian artist, hawaiian portrait, Janet Stewart, Keiki, Lahaina, Maui, mother and child, Oil Painting, Outrigger, Sunset, Sunset painting, Surfing, turtle painting, watercolor painting. You can follow any responses to this entry through the RSS 2.0 feed. Thank you for the great bio’s on these artists. I am doing something similar for art card creators. Visit http://www.artcardist.com for free info and biographies! 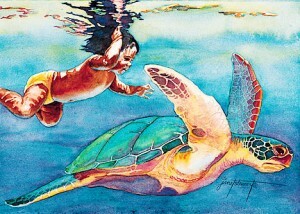 I stumbled upon your beautiful art creations on this website on island art store .com You are absolutely amazing!!! 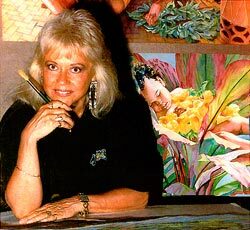 I to am an artist from Hawaii but am currently living up here in Seattle taking care of my mother. 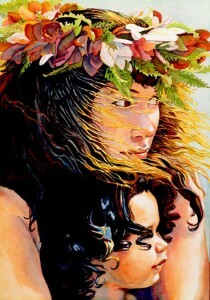 I did a piece years age that I titled “Ohana” it is sort of similar to your awesome “Keiki Milimili” piece. Please take a look at my Facebook page to view some of my art. I would love to friend you on Facebook and share art and thoughts on art. We are indeed like minded in this regard. Again your art is awesome.